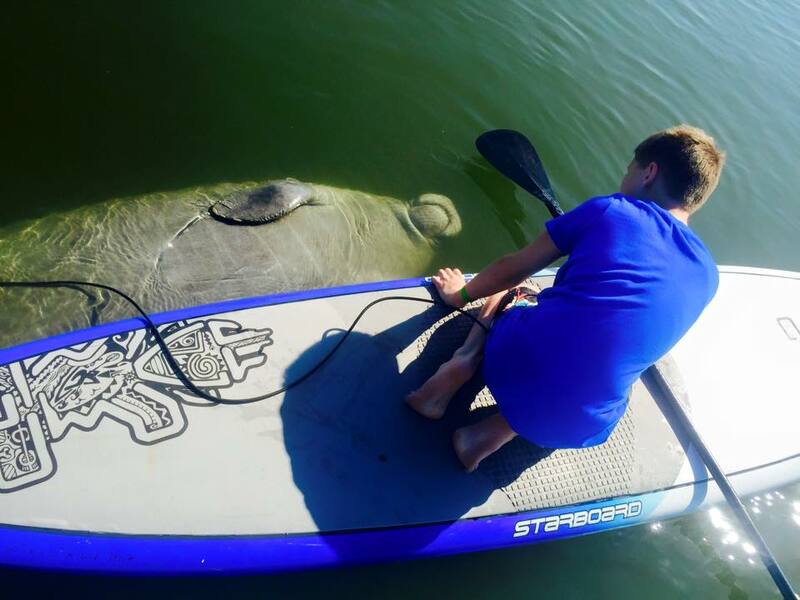 Experts in bioluminescence tours, manatee dolphin tours, eco tours on paddle boards or kayaks! 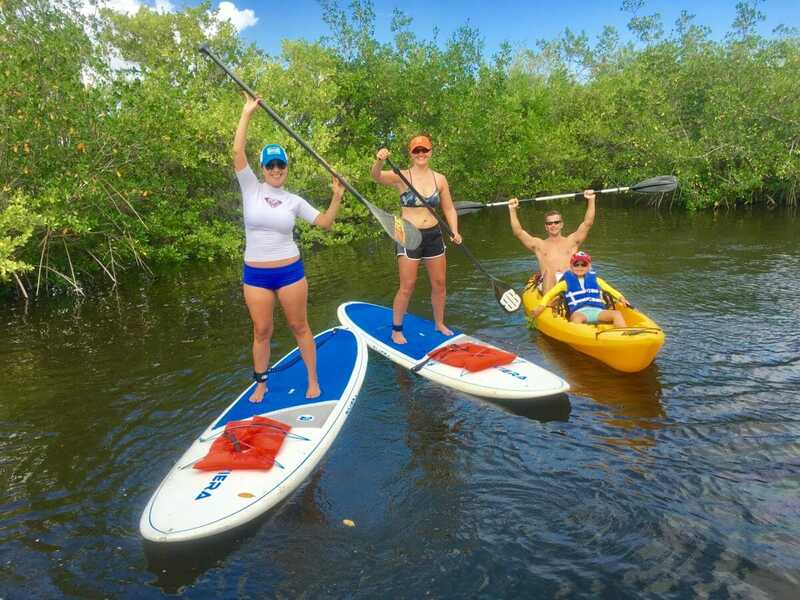 SoBe Surf offers kayak and stand up paddle tours in Merritt Island near Cocoa Beach, Florida with high seat-back kayaks and quality paddle boards, mix boards and kayaks for any tour as desired. We have a safe and quiet waterfront launch near our shop at the amazing Brevard Veteran’s Memorial Park & Museum, so if you have extra time before or after the tour, you can enjoy the museum… admission and parking is free! Our prices may be a few dollars more than the cheap Groupon companies, but you will appreciate the quality and integrity of our service. An easy 45 minute drive from Orlando, and only 7 miles from the Port Canaveral cruise ship terminal. SoBe Surf has the experience, local knowledge, equipment, and expertise to make your trip an amazing one! All 2 hour Paddle Board or Kayak Tours are only $75 per person for 2-3 person bookings, 20% discount for 4+ adult group bookings including photos! Large group and family discounts available upon request. We can handle very large groups. Have a look at the information below, and book online or call anytime for more info. We specialize in great times and look forward to talking with you! 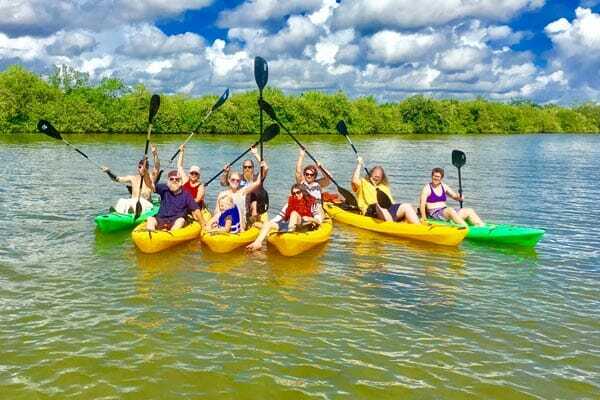 Paddle down the Banana River Aquatic Preserve to secret spots where we’ll have good chances of seeing manatees, dolphins, schooling fish, and many species of waterfowl and birds of prey. Tour includes all equipment (paddle boards or kayaks), free photos, and a short beginner lesson (if needed). Safe and easy for all ages and skill levels. High seat-back kayaks are also available on site. The Banana River Lagoon Nature Tour typically lasts up to 2 hours but we can adjust the duration upon request. Our day time tours depart from the amazing Brevard Veteran’s Memorial Park and Museum, so if you have extra time before or after the tour you can enjoy the museum.. admission is free! For Summer Bioluminescence Tours or special late afternoon tours, meet at SoBe Surf’s shop located at 635 S. Plumosa St., Merritt Island, Fl 32952 to sign in, then drive to our private launch just down the street from our shop. There is plenty of free parking and bathroom facilities at all locations! Family and large group discounts are available upon request. Call for 20% discount code for group bookings of 4+ adults. Book online or call (321) 926-6571 for more information! Bioluminescence Tours in the Merritt Island area of Cocoa Beach! Experience a magical nature adventure after dark on our standup paddle boards or high seat back luxury kayaks safe for beginners and the whole family! Our tours are small group and personal, with no massive crowds from other companies in the area we cover from our private launch. Bioluminescent plankton in the water will interact and light up, creating a truly phenomenal effect as you explore through the Banana River Lagoon Nature Preserve. It’s an experience like no other! Customer satisfaction is our priority, so we offer a full or partial refund if the bioluminescence isn’t showing (a rare occurrence … is usually bright every night during the Summer). 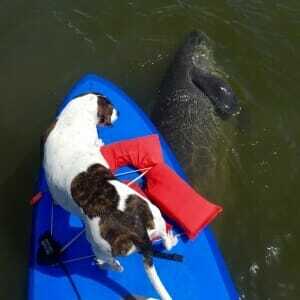 The Cocoa Beach and Merritt Island bioluminescent nighttime guided tour on SUP or kayak lasts about 1.5 hours. We provide all equipment, light, and tour guide. Beginner to advanced paddlers are welcome. Luxury high seat kayaks are available. This is truly a wonder of the world and a fun outing for all experience levels and all ages! Meet at 7:45pm at the Brevard Veteran’s Memorial Park 600 S Sykes Creek Parkway, Merritt Island, Fl 32952. Your guide will meet you at the West end of the Museum.. Our launch is just behind the Museum. Plenty of free parking at our launch. Book online or Call (321) 926-6571 anytime for more information. Cost: $75/person for guided tours, 20% discount for 4+ person bookings (call for code). A time-efficient trip to a secret manatee area where multiple manatees abound. Very short distance paddle once on the water. Tour includes all paddle board or kayak equipment, photos, and a short beginner lesson (if needed). 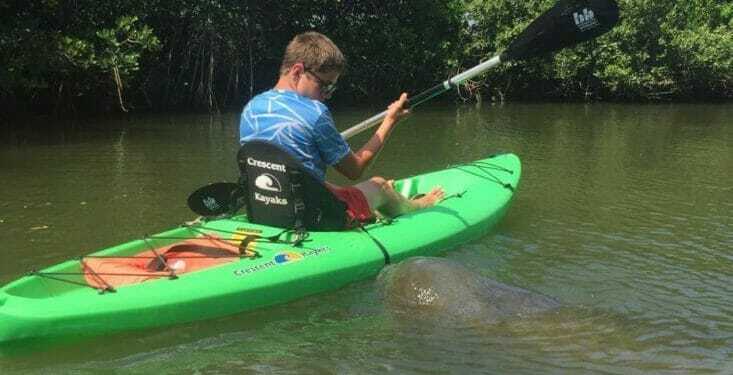 The Mucho Manatee Experience tour typically goes for 1.5 hours. Safe and easy for beginners. This is a great tour for those who want to have an amazing wildlife experience without having to paddle far. Meet at SoBe Surf’s shop located at 635 S. Plumosa St., Merritt Island, Fl 32952 to sign in, then drive to one of our launch areas, depending on time of years. Except for the few Winter months, we depart from the amazing Brevard Veteran’s Memorial Park & Museum, so if you have extra time before or after the tour, you can enjoy the museum.. admission is free! Large group / family discounts available upon request. We can handle up to 30 guests! Book online or call us anytime for more info (321) 926-6571! SoBe Surf’s Cocoa Beach area’s shop is located on Merritt Island at 635 S. Plumosa Street, an easy 45 minute drive from Orlando and Disney World, and only 7 miles from the Cape Canaveral cruise ship terminal. 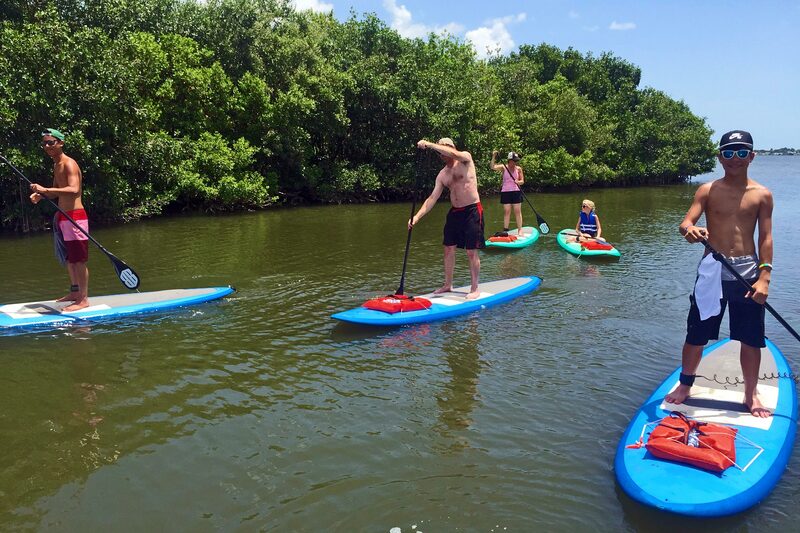 Our paddle boards and kayak fleet is kept at water’s edge at our private launch just down the street from our shop and at the amazing waterfront Brevard Veteran’s Memorial Park and Museum, so just park and paddle! Have a look at the map below for directions. We look forward to seeing you here and having a great time on the water! If you have any trouble finding us at our Cocoa Beach / Merritt Island location, just give us a call at (321) 926-6571 and we’ll be glad to help you out! Affordable shuttle access from Orlando and Port Canaveral is available from Happy Hour Shuttle! We are just 7 miles from the cruise ship terminal. Call them at (888) 601-6640 for rates and to make pick-up arrangements! Many of our cruise ship guest find it easy and affordable to Uber to our location and back to the Port. Ask about discounts for families, large groups, teams, military, and locals. We’ll be glad to help you out! Just call and we’ll give you a discount code to use during your online booking process. 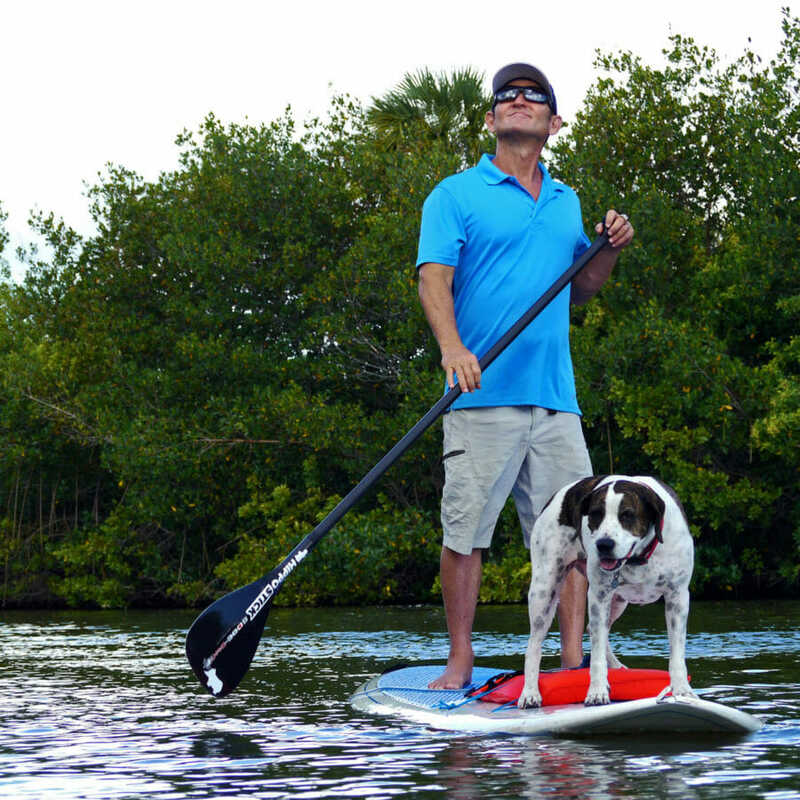 If a stand up paddle tour isn’t exactly what you’re looking for, check out these other things that we offer!